Steak is a protein-rich dish that is often reserved for special occasions, because it can be expensive. Although steak is a broad term, most restaurants use the term to refer to beef sirloin, a type of steak that provides rich flavor due to its moderately high fat content. 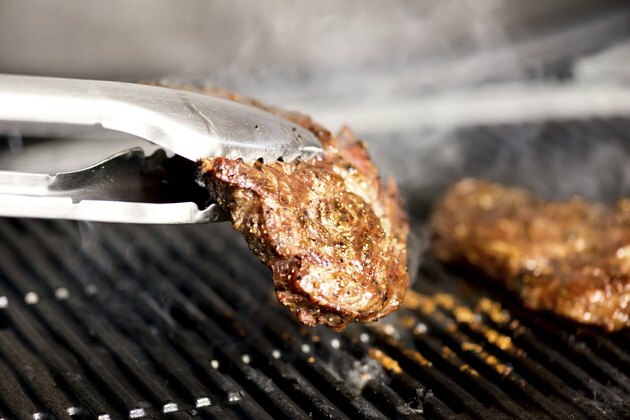 These nutritional facts refer to a broiled 5 oz top sirloin steak; if you prepare your steak with oil or top it with butter, the nutritional values are different. A 5 oz top sirloin steak contains 344 calories, or about 17 percent of the daily recommended intake of 2,000. It would take 35 minutes of jogging or 23 minutes of rollerblading to burn off 344 calories, according to the Mayo Clinic website. Steak, like other animal products, is a rich source of protein. A 5 oz serving of steak provides 38 g of protein, more than six times the amount in one egg. Protein aids in building and repairing muscle and other tissues. One drawback of steak is that it can be high in fat. A 5 oz steak has 20 g of fat, including 8 g of saturated fat. Too much saturated fat can increase your risk of heart disease; the American Heart Association recommends a daily limit of 16 g.
If you're on a low-carbohydrate diet, steak can be an acceptable menu item; it contains no carbohydrates. Research from the February 2006 edition of "Archives of Internal Medicine" suggests that low-carbohydrate diets can produce quicker weight loss than low-fat diets, but you still need to limit your calorie intake to lose weight. Steak provides numerous minerals, and it is particularly rich in potassium, magnesium, zinc and phosphorus. Steak is low in copper and manganese. Steak isn't rich in many vitamins, but it does provide some B vitamins such as niacin and choline. This food also provides low levels of vitamins D and K.